While Republicans are running unopposed — or not at all — in six of 10 Alaska Senate primary races, the slate of candidates in Anchorage's District L is more like a brunch buffet. 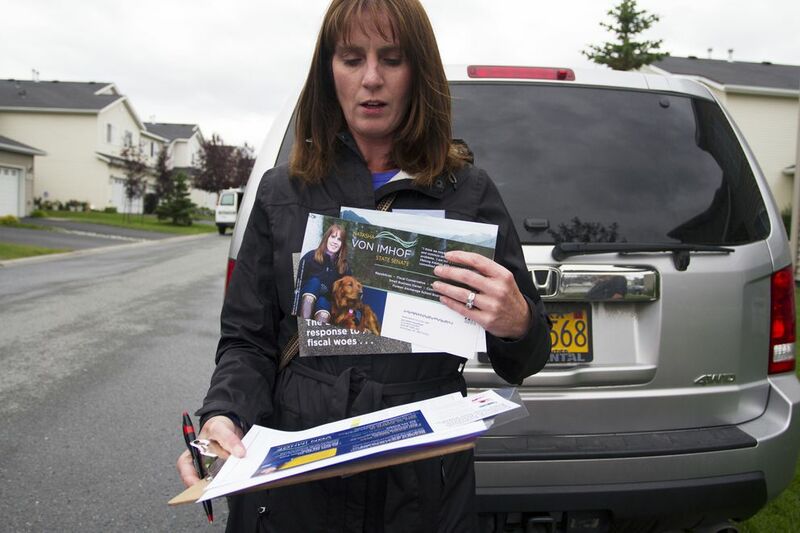 Three Republicans have mounted serious campaigns to replace retiring GOP Sen. Lesil McGuire, offering voters distinct choices in style and substance for the Midtown and South Anchorage seat. The race includes Anchorage Rep. Craig Johnson, a veteran member of the current House Republican leadership who's trying to move up to the Senate after entering the contest in June — months after his opponents. Another is Natasha von Imhof, a Harvard-educated former Anchorage School Board member who comes from a prominent Alaska banking family. She calls Johnson a "pseudo-incumbent" and says she could break through the gridlock that's plagued the Legislature this year and blocked the financial reforms proposed by Gov. Bill Walker. Then, there's 31-year-old Jeff Landfield, whose provocative signs and social media postings bely a methodical campaign and moderate politics. "You and von Imhof need to work it out, man — you're going to send Jeff Landfield to the Legislature," Art Chance, a former state director of labor relations, said when Johnson knocked on his door this week. "No, we're not," Johnson responded — even as he rapped his knuckles on the siding of Chance's house. Johnson, at 62, twice Landfield's age, is running on the work he's done in his decade in the House, pointing constituents to the new roundabouts and streetlights installed in his district. "Making South Anchorage the best place to live is kind of my goal," Johnson said. Johnson didn't formally file to run for the Senate until the last possible day — abandoning a near-certain re-election to his House seat for a three-way campaign against Landfield and von Imhof. In November, the winner will face either Roselynn Cacy or Forrest McDonald, Democrats in their own primary. "I suggested early on that Natasha run for the House, and she wanted nothing to do with it," Johnson said. His campaign started late, since incumbent lawmakers were back and forth between Anchorage and Juneau until earlier this month, and he's poured $35,000 of his own money — more than two-thirds of his annual legislator's salary — into his race. Of the three candidates, Johnson is the only one who doesn't support spending some of the Permanent Fund's investment earnings to help pay for state services — a move Walker and fiscal experts say should be the biggest piece of any plan to repair the state's massive budget gap. The slogan on Johnson's campaign signs is: "Fighting to protect your PFD." And in a speech on the House floor last month, he accused Walker of having "stolen" from Alaskans by vetoing half of this year's dividend, still allowing a $1,000-a-person payout. "He's not changed in the whole time he's been in the Legislature," said House Majority Leader Charisse Millett, an Anchorage Republican whose Juneau office is across the hall from Johnson's. "He's very solid in his conservative values — unabashedly so." Millett acknowledged, however, that Johnson may have to fight to overcome the anti-incumbent sentiment coursing through the electorate, the same force that propelled Donald Trump and Sen. Bernie Sanders, I-Vt., earlier this year. 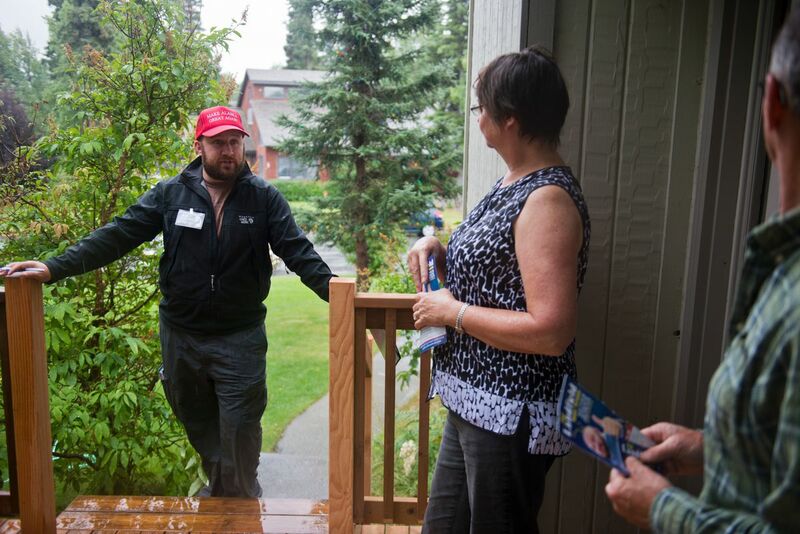 Johnson, during an afternoon knocking on doors in South Anchorage, got turned away from one house where the woman who answered told him: "My husband says we're not voting for you anymore." "I'll come back and find out why," Johnson said on the way back to his car. "For every person that says they're upset, there's 10 or 20 who like what I've done." Landfield, meanwhile, is appealing to residents' fears and frustrations about the budget deficit — and the Legislature's inability to fix it. He's the closest thing the Senate race has to Trump, and spent more than $2,900 this year on hats with a "Make Alaska Great Again" logo — a 49th state adaptation of Trump's campaign slogan. "They're walking billboards," Landfield said. Landfield says he doesn't agree with some of Trump's provocative positions and his exploitation of "fear" and "nationalism." But he adds the presidential candidate has tapped into widespread frustration with the political process. That's what Landfield is aiming to do himself. A recent mailer labels him "Juneau's worst nightmare," while one of his campaign signs says: "No incumbents!" It's placed right next to one of Johnson's. Landfield ran against McGuire in 2012 and got 44 percent of the vote in the Senate district. Since then, he's served on several boards and committees. Walker last year nominated him to a commission that oversees judicial ethics. The appointment, however, was ultimately undermined by the emergence of various injudicious photos — including some of Landfield in a revealing Speedo bathing suit, and another with his hands on a woman's breasts. Landfield has filmed an ad inside a rented helicopter as it flew above the Senate district, and another shows him emerging shirtless from a lake. His colorful public persona and campaign have earned him a robust social media following, but it's also left some potential constituents wondering if he's truly legislative material. 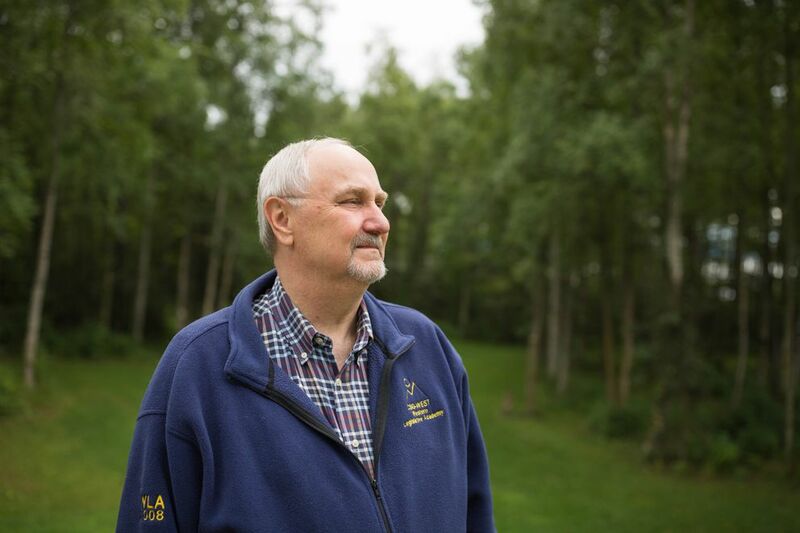 "I'm 65, and I've been a registered Republican since 1972 here in the state of Alaska, and I have issues with the presentation," said Ron Jordan, who succeeded Landfield as the president of the Taku-Campbell Community Council. "When you see him in the Speedo in Las Vegas and stuff, doing things, it makes you wonder a little bit if he's grown up enough to handle it." But Jordan also said Landfield is "very professional" at meetings, sticks to his agendas, and wears a suit and tie. On the stump, he's energetic and affable, with centrist politics: He supports using some of the earnings from the Permanent Fund to help balance the state budget, he backs women's abortion rights, and he's drawn support from organized labor. He's also a born salesman — for his own campaign, and in his day job working for telecommunications company GCI. "I'm good at selling things — in politics, you're selling yourself. What makes you better than the other guy?" he said. "That's why I love going to houses with Natasha signs." GCI and its chief executive, Ron Duncan, have mounted an aggressive campaign pushing lawmakers to approve financial reforms. But Landfield insists he'd keep his employer at arm's length, and says his own campaign has been unsuccessful in drawing support from GCI executives. Two GCI vice presidents have contributed to von Imhof's campaign and not Landfield's; his donations come from lower-level employees. Landfield dismisses von Imhof as a wealthy member of the state's political establishment, saying: "She's bothered she actually has to talk to the commoners." Von Imhof, 46, does come from one of Alaska's wealthiest families. She was born Natasha Rasmuson — the granddaughter of banker Elmer Rasmuson — and her father, Ed Rasmuson, chairs the board of the Rasmuson Foundation, which has $652 million in assets. But Von Imhof campaigns in Xtratufs, with her golden retriever, Jago, occasionally in tow. She's raised more than twice as much money as either Johnson or Landfield, and she has a paid strategist, Willis Lyford, and campaign manager, Shareen Crosby — positions few legislative candidates can afford to fill. But unlike her two opponents, von Imhof says she wrangles her own voter data with a file she bought from the state elections division, then fed into Microsoft's Excel spreadsheet program. Her methodical, detail-oriented approach is one she applies to her work and daily life, too. "I do my grocery lists on Excel," von Imhof said. Von Imhof said she drew up a life plan at age 30, after the death of her grandfather and birth of her daughter. She wanted to go to business school, run a nonprofit, and serve on the board of a large organization. Her plan didn't include running for public office. But von Imhof was spurred to run for the school board after she felt stonewalled by officials when they made changes to a math program in which her kids had been enrolled. During her three years on the board, von Imhof was more conservative than most members, but she was willing to work with and listen to them, said Tam Agosti-Gisler, who served with her on the board and is supporting her campaign. "I really enjoyed working with someone who was willing to entertain facts and information, data, to inform their actions," Agosti-Gisler said. She added von Imhof was quick to "roll up the sleeves" and "get dirty" and said attacks on her background were misplaced. The only time von Imhof was criticized on the school board, Agosti-Gisler said, was when she offered to fly members to Juneau on her father's jet to save the district money. "A lot of people said, 'Oh they'd think we're in the pocket of the Rasmusons,'" Agosti-Gisler said. Von Imhof supports spending some of the Permanent Fund's earnings to help balance the budget — she's proposing a four-point deficit-reduction plan, which also includes a state spending cap, deeper budget cuts and opposition to a state income tax. She cites her experience to draw a contrast with Landfield, saying: "We're not electing someone to be social chairman." And her position on the use of the Permanent Fund is a break from Johnson's uncompromising defense of constituents' dividends. Von Imhof said she thinks district residents aren't just concerned about their annual checks. They're worried about the broader economy, too — the value of their homes and quality of schools — and reducing the state budget deficit with some of the fund's earnings will help stabilize things, she said. "People are really worried about whether they're going to have a job in a year," she said. Disclosure: Alaska Dispatch News Executive Vice President Margy Johnson hosted a fundraiser tea for von Imhof earlier this year.